전문분야 한국어 전공하신 한국사람과 문화를 사랑하는 선생님입니다. 한국어가 가능하셔서 초급자분들에게 강추합니다. 유쾌발랄하시고, 유머가 좋으셔서 재미있는 수업 진행하여주십니다. 엔토 매니저님! 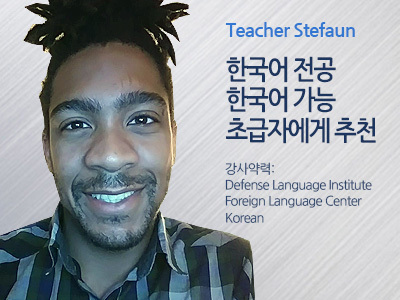 Stefaun 선생님은 어떤 분이신가요? 한국어를 전공하신 한국사람과 한국의 문화를 사랑하는 선생님입니다. 공감대를 형성해서 많은 대화를 할 수 있어요. 한국어가 가능하셔서 초급자분들에게 강추합니다. 유쾌하시고, 유머가 좋으셔서 재미있는 수업 진행하여주십니다. Hello, my name is Stefaun, but you may call me Eli which is short for my middle name, Elijah. I attended a language institute in California where I earned my degree in Korean and learned the Korean language. I believe that my knowledge of the Korean language and culture will help us form strong bonds between English and American culture. I look forward to seeing you in class. Thanks for listening! 안녕하세요. 제이름은 Stefaun입니다. 하지만, 제 middle name 인 Elijah를 줄여서 Eli 라고 부르셔도 됩니다. 저는 캘리포니아 Language Institute 에서 한국어 학위를 취득하였고, 한국어를 배웠습니다. 저의 한국어실력과 문화에 대한 이해는 영어와 미국문화에 가르치는데 큰 도움이 될것입니다. 수업시간에 만나뵙기를 고대합니다. 들어주셔서 감사합니다.